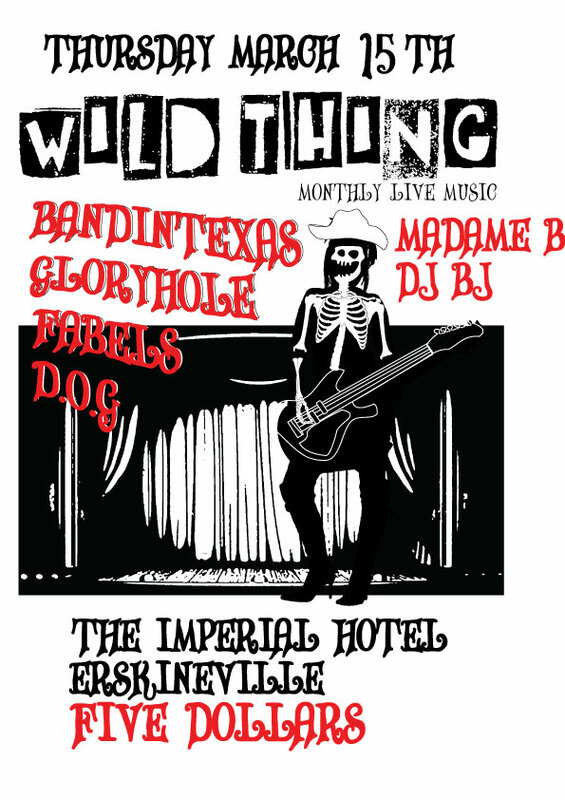 WILD THING is a collaboration of bands, performers, DJs, visual artists and oddities. The next WILD THING is a rock n roll circus featuring live performances by AXIS, SHOW PONY and GOD-K followed by short magical stage acts. WILD THING is returning to town and this time we are covering different venues around Sydney. The line up is pretty rockin for this show.. Doors open 9PM. Entry is $10. WILD THING is going underground on FRIDAY JUNE 8TH and will be bringing together the rock, experimental, punk and electro sounds of KORO VACUI, BANDINTEXAS, PINK FLOOD, SPACE TICKET, O.T.T and CHERRY 2000 into the basement bar of the IMPERIAL HOTEL. The basement bar holds approximately 500 people and has an amazing light and sound setup.. so this should be an awesome night! Along side the 6 live performances GONZ and ROCKY will be bustin out some tunes including 50s rnb rockabilly, blue eyed soul, hip-hop, electro, 60s rock, punk and whatever other genre that will make you dance. Glow sticks will not be provided. Tickets are available through www.moshtix.com.au and moshtix outlets including red eye records and resist records.